I’ve heard more comments regarding the following story than anything I’ve written in a long time. There are two reasons for the influx of interest. 1) It’s an incredible series of events. 2) The main character is a genuinely likable person. If you missed it, here’s the article. David Yount is one of those guys with a knack for finding great things. As a collector who specializes in political memorabilia, especially items relating to his home state of Indiana, he often seems to be in the right place at the right time. But what happened this past year is a story that seems too implausible to be true. Trust me, it really happened. I was there for part of it. In late March I attended a Walther & Hawkins auction in Richmond, Indiana. The sale offered a varied mix that included boxes of vintage photographs. 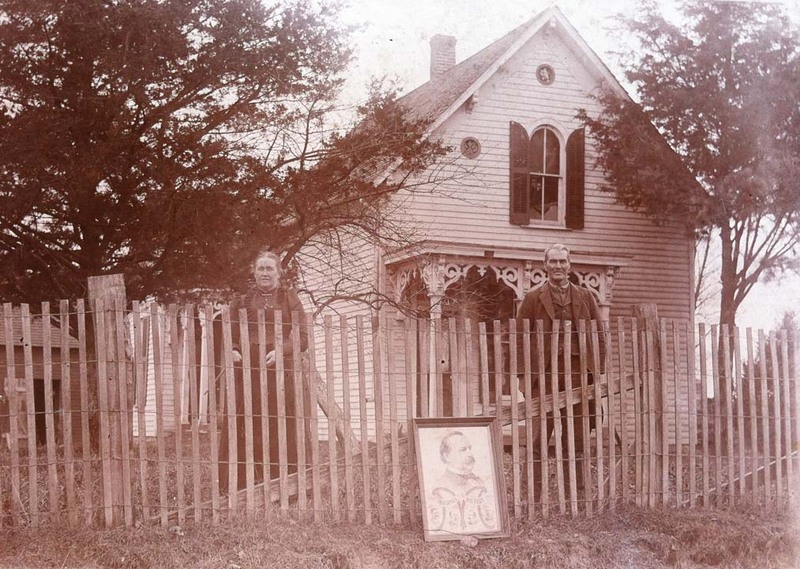 While shuffling through a beer flat filled with mounted albumen images, I came across one showing a couple standing at a picket fence in front of their home. Leaning against the fence was a framed poster. Digging a loupe out of my pocket, I got a better look at the poster. 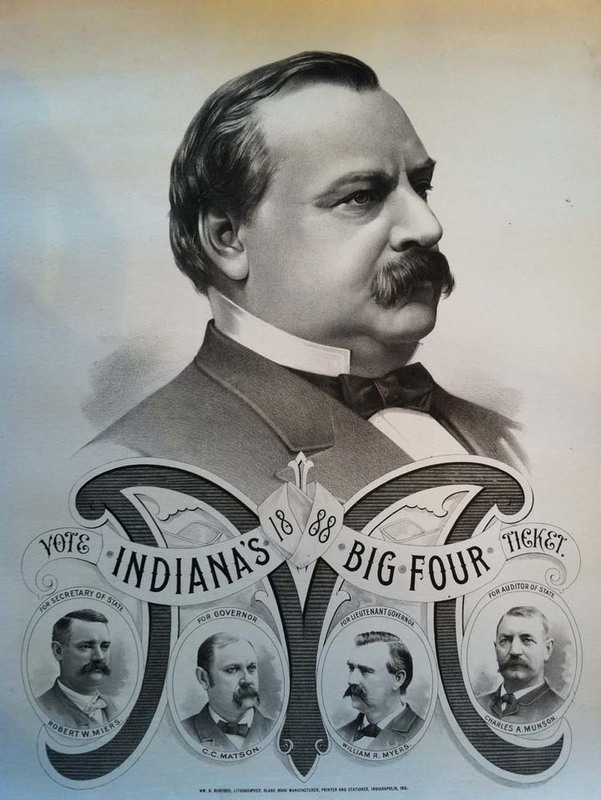 At the center was text that read “Vote Indiana’s 1888 Big Four Ticket.” The words bisected a large image of a mustached gentleman and oval vignettes of four other guys. Suddenly my mind was racing. Knowing Yount would love this photo, I stood at the table, desperately wondering how best to get in touch with him. (Completely forgetting, I might add, that his cell number was in my iPhone.) Just then I looked up and, to my utter surprise, he walked into the room. “I think I found something you might be interested in,” I told him. Having traveled to the auction to bid on a Goldwater car topper, Yount assumed the light-up auto accessory had me excited. Instead, I escorted him to a table, pulled the photo to the top of its box, and pointed. “Take a look at the poster leaning against the fence,” I said, handing him my loupe. I don’t recall his exact words — something to the effect of, “I don’t believe it!” Then he turned to me and, in almost a whisper, said something that took me totally by surprise. “I just bought that poster,” he quietly revealed. Needless to say, he left the auction with the photograph, which now hangs in his home. Beside it is the poster it depicts. This wasn’t just any poster. But that’s getting ahead of the story concerning his acquisition of that piece. Last September Yount was contacted by a friend regarding an auction located between Rushville and Metamora, Indiana. The sale, he was told, had a Grover Cleveland political bandana. When he checked photos posted online by the auction company, however, it wasn’t the textile that caught his attention, but another political piece — an 1888 Grover Cleveland poster he’d never seen before. Despite some damage to the item, Yount knew he had to have it. But, there was a problem — he couldn’t attend the auction because he was hosting a stoneware group the day of the sale. Yount contacted another friend and asked him to buy the piece. That’s exactly what happened. Yount got the poster, which was subsequently restored. “It hangs in my den today,” he said. Roughly six months later, he walked into an auction to buy a Goldwater car topper and found me staring at him in disbelief and delight. I had no idea of the dots that were about to be connected that day. It’s still hard to believe. The poster, it turned out, was previously unknown. Printed by Wm. B. Burford of Indianapolis, it showed not only Cleveland, but also Indiana’s candidates for the state’s top offices: C.C. Matson for governor, William R. Myers for lieutenant governor, Robert W. Miers for secretary of state, and Charles A. Munson for state auditor. It’s worth noting, they all lost — Cleveland, Matson, the whole gang. “Cleveland’s coattails were rather short,” Yount quipped. Cleveland did go on to win a trip to the White House in 1892. Finding a photograph showing that piece of political memorabilia, and doing so just months after he had acquired the original poster, is as improbable as it is incredible. Yount agreed. It’s intriguing to know that the two people in the photo were such ardent Democrats they not only owned a copy of the poster, but also posed with it. No doubt, they were heartbroken when Cleveland won the popular vote but lost the election to Benjamin Harrison (a Hoosier, it’s worth adding). Just as hard to take, in the Indiana gubernatorial race, Matson was defeated by Republican Alvin P. Hovey by a margin of 0.2 percent — a mere 1,149 votes statewide — while the Prohibition candidate affected the outcome of the race by garnering 2.2 percent of the ballots. There was no identifying information on the photograph. No photographer’s imprint. No inscription. It’s unlikely the identities of the two figures will ever be known. Another mystery remains. How did the political poster and a related homestead photograph turn up six months apart at two different auctions in east-central Indiana?